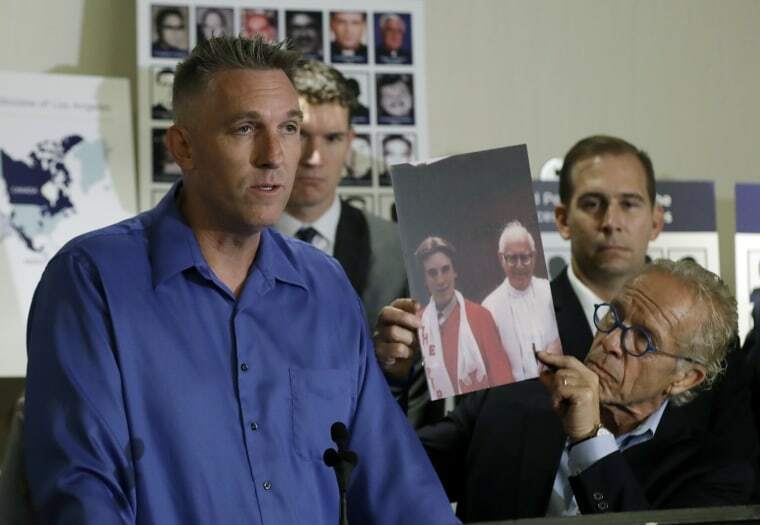 LOS ANGELES — A man who says he was sexually abused decades ago by his parish priest said Tuesday he is suing all Catholic bishops in California and the Archdiocese of Chicago, seeking to compel church officials to release records on clergy abuse. Emens said at a news conference that he was abused for two years starting in 1978 when he was 10 years old by Monsignor Thomas Joseph Mohan. The priest, who is deceased, arrived at St. Anthony Claret Catholic Church in Anaheim in the early 1970s from Chicago, according to the lawsuit. Attorney Jeff Anderson said the goal of the so-called nuisance lawsuit is to force the church to reveal the names of all priests accused of child molestation. He said church documents would reveal a playbook among bishops and other officials to protect offending clergy by keeping files under wraps and moving the priests across the country and, in some cases, out of the U.S. The California Catholic Conference of Bishops, which oversees the state's 12 dioceses, didn't directly address the lawsuit in a statement Tuesday afternoon. Instead the group pointed out the "positive steps taken by California dioceses over the past 15 years to protect children and young people from abuse." Reforms implemented in 2003's Charter for the Protection of Children and Young People include "fingerprinting and background checks for priests, staff and any volunteers working around children and young people," the statement said.